The South West is one of the best places in the Country to have your wedding and we have joined forces with the Carbis Bay Hotel, Tregenna Castle and the Harbour Hotel three of the best wedding locations in the St Ives Bay area to make your wedding day as amazing as it can be. Whether you are getting married, being a bridesmaid or simply a guest at a wedding, we have got the perfect wedding hair styles for you. 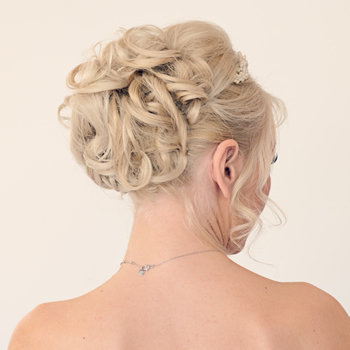 Consult with our wedding hair specialists at Karina Zimmer Hair Design for all your wedding hair requirements. 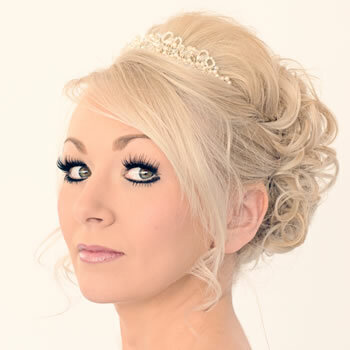 We recommend a wedding hair trial consultation is carried out beforehand to give you piece of mind and reassurance you are getting the style you desire on your most important day. At the hair trial consultation it is a ideal time to discuss your wedding hair style, ask any questions and make any suggestions for your wedding hair. You and your wedding guests are welcome to come into the salon and have all your hair styles looked after by our wedding hair specialists. We can come to you at your location. Please spend time with us to discuss your ideas, look at pictures and try out some styles beforehand. If you are planning on wearing your hair-up then we do recommend that it be washed and dried the night before. We will work with your wishes should you be inspired by photographs or images in magazines or other media. Please bring these styles along to your hair trial consultation. * A final price will be given at the hair trial consultation appointment. * A travel charge will apply when specialists visit your location. * To secure your booking please note a 50% deposit is required on booking wedding day hair. Deposits are non-refundable in event of a cancellation. Real Hair Extensions by Great Lengths. If you would like to add volume or length to you hair for the big day we have a Great Lengths specialist with over 20 years experience. Please let us know if this is something you will require at the time of booking. If you are interested in Karina Zimmer Hair Design styling your hair for your big day, please use the form on the Contact Us Page or you can call us on – 01736 795847.